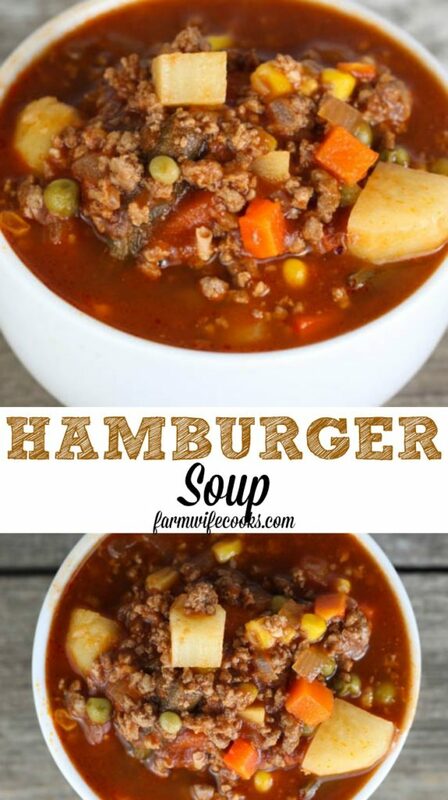 Hamburger Soup is a quick and easy meal idea packed with vegetables, ground beef, beef broth and tomato juice. 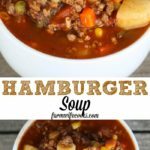 Hamburger Soup uses ingredients you probably already have at home and it freezes well! 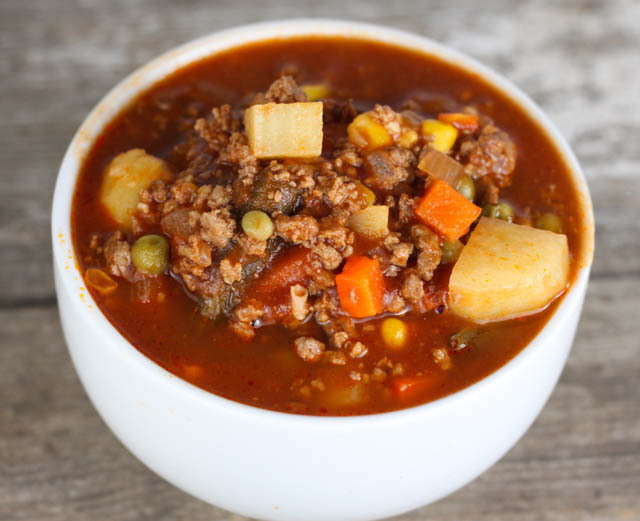 I love soup, especially on cold days when my crew needs warmed up from working on the farm. It’s usually easy to make and I almost always have the ingredients on hand which is a bonus for a busy mom and farmwife! This recipe is easy to make and ingredients can be left out or substituted based on preferences. Start by cooking the ground beef and then sauteing the onions, garlic and tomatoes. Add remaining ingredients and it will be ready in no time! 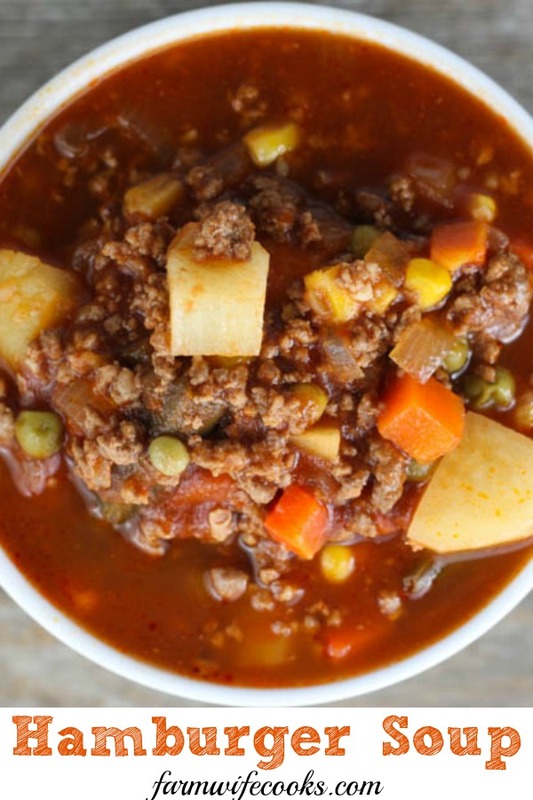 Soup is an easy way to hide veggies for your picky eaters. I would recommend microwaving the vegetables and then putting them in a blender to puree. Then add the pureed mixture to the remaining ingredients. 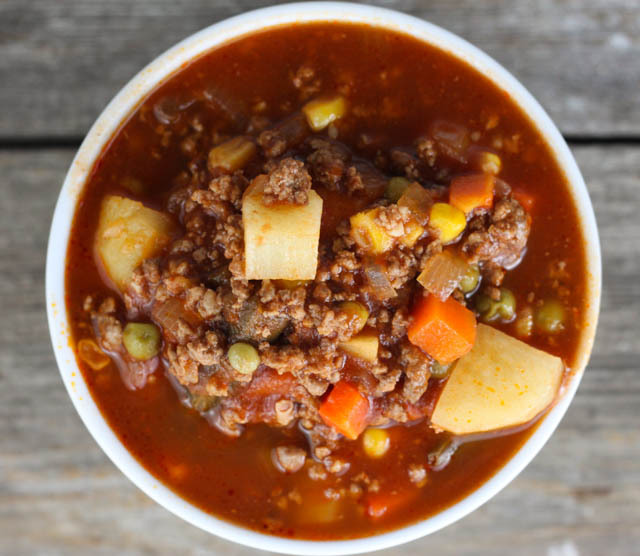 You can also do this with beans in chili and soup. I love to serve soup with grilled cheese sandwiches, they are always a hit with the boys. We love to dunk them in our soup like you would dunk an Oreo in milk. Doesn’t get much better! Add onion, garlic and tomatoes and saute for 5 mins. Add remaining ingredients and cook for 15-20 minutes or until potatoes are tender. It is really good with green chilies and Rotel tomatoes and I also poke some holes in fresh jalapeños and drop them in there. This version has my husband written all over it he loves spicier food! Can’t wait to try this. Absolutely l o v e your site! How would you go about freezing this with the potatoes? Should I leave them out or just half-cook them? I would do everything the same but I wouldn’t cook it for the 15-20 mins part, instead I would but in freezer container and freeze. Enjoy! Do you suppose this would work with ground Turkey or chicken? I have never made it that way but I think it would be worth trying! Could this be done in the crockpot on low?